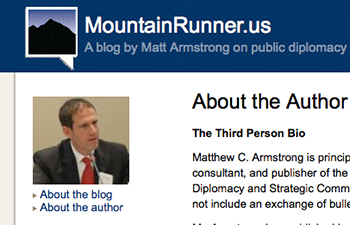 The Mountain Runner blog follows the latest developments in public diplomacy. We’re a nation at war. At war not with another nation, but with a hateful ideology violently expressed: terrorism. Every militaristic move a terrorist makes is designed to intimidate, frustrate, agitate….in short, communicate. Physical destruction and loss of life, crass as it sounds, are means to those ends. In this sense, the war of ideas is no longer a metaphor or a figure of speech — it’s a literal war in which we now find ourselves. And in a war of ideas, public diplomacy will be an important tool in our national security toolkit. If you’re just joining us — and haven’t yet had a chance to read Part 1 of this post — public diplomacy is the practice of influencing public opinion abroad in order to achieve America’s foreign policy goals. 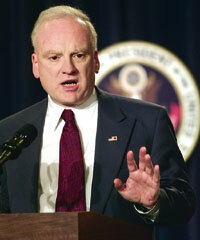 It’s primarily the responsibility of the State Department and the Broadcasting Board of Governors. As former Under Secretary of State Jim Glassman explained in the comment section of my last post, it’s all about “understanding, informing, engaging and influencing foreign publics.” It’s alternately characterized as a “war” of ideas or a “global marketplace” of ideas. As the modern technology becomes more commonplace, America’s enemies will inevitably develop increasingly destructive armaments. And with the rapid proliferaiton of Internet technology, some in the national security community are turning their attention to the possibility of large scale online attacks — “cyber-terrorism” — and how public diplomacy may be one way to prevent them. Being able to communicate ideas and counter misinformation and distortion has always been essential to peace, stability, and national security in general. 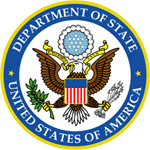 Recognizing that many of the most influential international actors — friend and foe alike (e.g., foundations, NGOs and terrorist organizations) — are not bound by national borders, Armstrong proposes a Department of Non-State, more similar to the now-extinct U.S. Information Agency than the current State Department, which would commandeer public diplomacy responsibilities to deal with non-state entities. Regardless of whether this specific recommendation is feasible, the suggestion to “think outside the border” seems sensible enough given these 21st century realities. It is no secret that support for the United States has dropped precipitously throughout the world in recent years. Many experts believe this is due not only to various U.S. foreign policy developments but also to the method by which we conduct our Public Diplomacy…This lack of focus was also partly due to the belief that, with the collapse of the Soviet Union, we had won the “War of Ideas” — a belief that 9/11 quickly shattered. The “war of ideas” is — and will continue to be — an increasingly important front on the War on Terror. And much of this war of ideas will be played out on through new media such as the Internet. You can take virtually any major sector of our economy — or, for that matter, the government — and do a vulnerability analysis and discover that it’s relatively easy to alter information, disrupt and confuse the system, and even shut the system down…shutting the system down has consequences — the electric power grid crashes, trains stop running, airplanes crash into each other. While there have been a few examples of politically motivated hackers attacking certain government websites (a phenomenon known as “hacktivism”), there have as yet been no incidents of sabotage on the scale that Clarke described. Also relevant, the hacktivism that we have seen so far has not been perpetrated by known terrorist organizations. As a result, some critics think the concept is overblown. 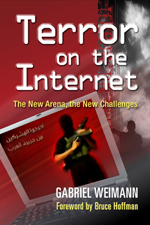 Indeed, in his book Terror on the Internet, Gabriel Weimann is limited to investigating “how modern terrorist organizations exploit the Internet to raise funds, recruit, and propagandize, as well as to plan and launch attacks and to publicize their chilling results” since there are no examples of direct terrorist attacks via the web. That is, terrorists have turned the Internet into a battlefield in the war of ideas, but there’s little evidence that these organizations have, in a physical sense, weaponized the Internet.